Each certificate is comprised of 12 modules developed by Thunderbird faculty, and delivered via the Thunderbird learning environment. Each module runs approximately 120 minutes. How is the Certificate Formatted? 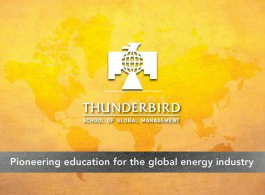 Discover Thunderbird's history and expertise in the global energy industry.